Today, mobile site optimization has become necessary for websites around the globe. If you don’t have a mobile-friendly website, you are losing a lot of potential traffic and customers. Mobile site optimization is necessary because users are now shifting to mobile devices and are spending more time on mobile devices than desktop. Mobile searches are increasing day by day and mobile is no longer used only for research, people are using mobile for purchasing too. Mobile site optimization has become very important for local businesses as a lot of local searches for services are now happening on mobile devices. 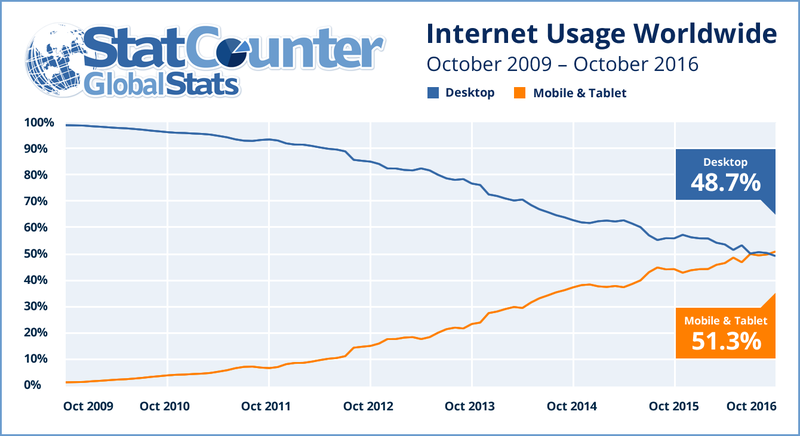 In 2016, mobile overtook desktop as the primary device to access websites. Let’s explore more about the above mentioned factors. Responsive web design is having a web-page that adjusts itself to the size of user’s screen. It is done with the help of CSS files to adjust to the page styles of common devices (smartphones, tablets, etc.). If you are not using any CMS (like WordPress), it might be a bit costly to implement. Easy user interaction as the URL won’t change from device to device and their bookmarks will work perfectly. It provides better crawl efficiency for Google. It’s even easier for developers as they have to make changes only at a single code base. It’s not prone to mistakes which are made while having different mobile websites. The option for customizing UI and messaging becomes thin as it is a desktop website that can be viewed on mobiles, not a website designed specifically for mobiles. If affects the page loading time as the entire website gets loaded. The site alters the HTML for different devices. For e.g. : if the website is opened on the desktop, the mobile content is hidden. User experience can be customized for different devices. Easier to customize for search engines. Managing code requirements and content updation can be tough. What is separate mobile site URL? There are three ways to create a separate mobile site URL: a mobile directory, a separate top-level domain or a mobile subdomain. However, a separate top-level domain is not a good option. So, we are left with either using a mobile directory (domain.com/mobile/) or a mobile subdomain (mobile.domain.com). The mobile subdomains may inherit Domain Authority from the parent domain. Segmentation can be done easily on Google Analytics for mobile subdomains. Having a subdomain can make it easy to customize the user experience. The mobile directory will inherit more of the Domain Authority from parent domain. For the mobile directory, one Google Analytics setup works fine. Two code-bases to be maintained. Pointing a specific directory to a different server than the rest of the site can be difficult to set up for the mobile directory. The mobile directory is generally not recommended by search engines. Native mobile apps are the most common ways users interact on mobile devices. However, apps are not a good stand-alone option for businesses because for using apps, users have to download the apps. Apps can be a great way to engage the users if you already have a mobile-optimized website. Improving the user experience is as important as making a website mobile ready. If the user experience is not up to the mark, a website can lose a great amount of traffic. Website Navigation – Website navigation should be as simple as possible because people don’t want to deal with complex structures when they are using mobile devices. A simple website navigation is considered the best. Website design plays an important role in website navigation. In the first fold of the website menu tab, a brief intro of the website and a proper CTA should be present along with a banner image, if you want. Based on different genres or services, the content in the first fold can be different. For e.g. : for a service based website, the first fold should contain the business description, menu, tap to call button (CTA), and business logo. Whereas for an e-commerce website, the first fold can contain login/sign-up link, banner images with the latest offers, or new launches, and menu. The layout of the page changes from page to page. For a service page, the first fold should contain service description, a proper CTA and menu tab. Whereas for a product page, the first fold will contain the product image, a brief description and the rating of the product. When you create a mobile website, it is not necessary to keep all the pages of the website in the mobile version. Just keep the important pages. Keeping more number of pages will increase the website loading time. Tap to Call – Tap to call option should be present in the mobile version as it makes it easier for users to get in contact with the website with just a simple tap. Ideally, tap to call button should be present on all the pages of the website, but if that is not what you want, it is suggested to have tap to call option on the homepage, contact page, and services pages. Forms – Forms are the best way to capture user information, but many users on the mobile device do not want to fill out long forms and enter a lot of details. So, keep the forms as small as possible with minimum required segments. Using checkboxes and radio buttons is a good way to increase user experience. Images – Keep the images lightweight and crispy clear. You don’t want users to wait for the image to get uploaded or zoom the image to read the text on it. If you are using a responsive website, your images should be responsive too. Page Speed – Page speed is one of the most important factors when it comes to mobile site optimization. According to Search Engine Land, “Over half of mobile users will leave a website if it takes longer than three seconds to load”. You can’t control the internet speed of any mobile user, but you can always improve the loading time of your website. Use the Google Page Speed Insights to get some pointers where you can improve. Measure and minimize the server response time. The longer a server takes to respond to a browser request, the slower the page loads. Avoid or minimize redirects to improve the page loading time. Redirects take users from one page to another and that kills some milliseconds. Measure and reduce the round-trip time, the time taken by a request for data to be transmitted from a desktop computer or mobile device to a target destination. Always load the above-the-fold content before below-the-fold content. Code your web pages so that the above-the-fold content is loaded first. Use Google Pagespeed Insights tool to optimize and minify CSS and JS files. “Minification” eliminates redundant or simply irrelevant data without affecting how a page displays. Use gzip compression to reduce the file size. Menus – Keep the menus short and sweet. Don’t show the entire menu at once, keep the menu like it is only displayed after a tap on the menu icon. Ads on The Website – If your website shows ads, keep in mind that it should not occupy the entire screen or keep popping up as it will irritate users and they will jump off to other websites. Site Search – Always keep your site search visible and ensure that the results are relevant. Single Window – Do not take your users to a new window for any click. Users don’t like getting back and forth from tab to tab especially on mobile devices. Pinch to Zoom – Keep your fonts, images, forms, basically everything so clear that users need not pinch to zoom in for any type of work. “Near me” searches – Optimize your website for all the “near me” keywords relevant to your services. NAP – Use location specific NAP. If your business has branches, create citation with all the locations. Pages – Create location-specific web pages if you have different business locations. Meta – Use location-specific keywords in meta tags and keep updating it on a regular basis. Structured Data – Use schema for each location. Now, let’s see them one by one. 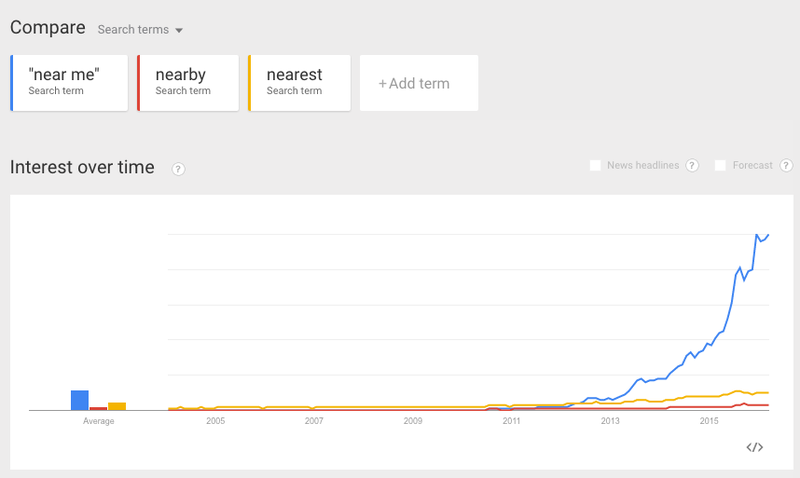 “Near me” searches have shown a great spike in recent 2-3 years. It is necessary for local businesses to optimize their website for near me searches else they are going to lose a great amount of traffic and conversion. How can you optimize your website for near me searches? Optimizing your website for near me searches is not tough. You have to do all the things that you already do for your business website, you just have to give more importance to “near me”. Keep the business address up to date on Google My Business and keep your NAP consistent among all citation websites. Make your website mobile ready because most of the near me searches are done on mobile devices. Collect reviews from customers. Boost your local SEO by getting reviews on your Google My Business page. Reviews always affect the decision making of any online customer especially for near me searches. Create appropriate local content for your website. Share content and images about local events and activities, connect with local bloggers and influencers. Add the ‘keyword’ in your content. Being a local business, you can’t add the keyword ‘near me’ in your content, but you can add the variants like ‘near you’, ‘close to you’, etc. Creating location-specific citations can be very helpful for LSM clients. Location-specific NAP can help you attain good rank in local searches. If your business has branches or serves more than one location, create the citation for each location with the proper NAP. If your business has branches, create all the location specific pages and add proper address and services provided. Creating location based pages will help in getting better ranking for location-based search. As we all know that meta tags play an important role in getting impressions on SERP and a better ranking, so always try to keep your location details in meta tags. Using location in the page title and meta description is a good practice to showcase your location. Also, mobile devices display page titles only for 45 characters. So, aim to limit your page title to only 45 characters, unlike for desktop which is 65 characters or try to add important keywords and other information in 45 characters. When users search for a particular business then a knowledge graph may appear if any business matches that query. When a user searches for a type of business, a list appears with the matching business type. For e.g. : if any user is searching for a place to have dinner, a list of restaurants will appear. How can structured data help in local optimization? Structured data is a great way of providing information to Google and Google also provides a number of ways to add structured data. There are options to provide business hours like standard hours, late night hours, all-day hours, seasonal hours. If you have multiple departments with their own distinct properties such as opening hours, phone numbers, you can use the ‘department’ markup to differ the sub-departments. You can create lists like restaurants with the help of ‘ItemList’ markup and markup individual restaurant pages. You can also provide different order and reservation scenarios like order food delivery, reserve fitness class, reserve restaurant. You can provide the type of business you have, that helps Google in displaying your page for the appropriate queries. These are just a few examples of what you can do with the help of structured data. There are more useful things you can find for your business when you start working on structured data. Heat Maps – Heat maps are very helpful when it comes to deciding what you can do for increasing user experience. By using heat maps, you can determine whether a form is getting expected number of clicks or not, whether you need to change the position of the form and many other things. You can also check if your CTA is proper or not, your navigation is helping the users or not, etc. 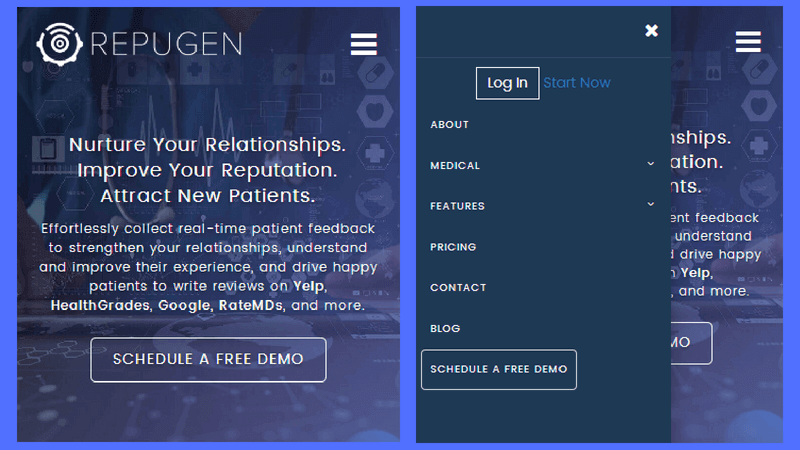 A/B Testing – You can create 2-3 variations of mobile-specific pages and check which one is working the best. You can change layouts, form structures, placements, etc., and stick to the one that provides the best results. Google Analytics – Last but not the least, you can always use Google Analytics for decision making. By using the user tracking feature of Google Analytics, you can check which pages are working fine and which are not.